When you play a CD or DVD, you would usually hear as sound source for body sensing sound reproduction; you may not sometimes feel so enough or even unnatural vibrations with less excitement as it is expected, because it contains insufficient lower frequency ranges. Based on our long lasting experiment and experience in the past decades, we are aware of higher frequencies such music instruments as a violin or a flute produce, would not be transferred to the body in many technical applications. Sound effects which don’t contain low frequencies sufficiently, may cause no vibration; furthermore, they will produce unnatural vibration on the body, in case it contains low frequencies with non-vibration effects. On the movie theater seats equipped with a body sensing sound system, particular scenes in the movie which do not require vibrations like male actor’s voice, sometimes create uncomfortable vibration. In those particular scenes, however, the VISIC system eliminates them for natural movie view. The system has been modified and redeveloped for better vibration effects and it’s reverse effects. 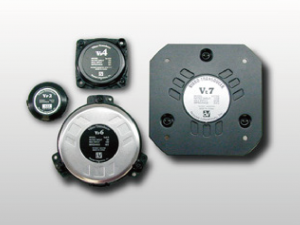 The VIBRO transducers, Vt7/Vp6/Vp4/Vp2 which reproduce vibration, are such devices as can produce ultra-low frequencies down to 16 Hz which used to be believed to be impossible to be reproduced. There had been no music CD software with body sensing sound effects, before VIBRO transducers was developed. Acouve Lab. has developed and develop music that includes body sensing vibration. It offers exquisite vibration to the body by combination consisting of rhythm, melody and harmony. Mr. Olav Skille Ph.D. of Norway published in the ISVA Congress 2008, himself developed VAT (Vibration Acoustic Therapy) which frequencies are between 40～86Hz combined with low frequencies, and is being expanded to medical applications, not only in Northern Europe, but also other countries of the world. In Norway, GaiaCare. 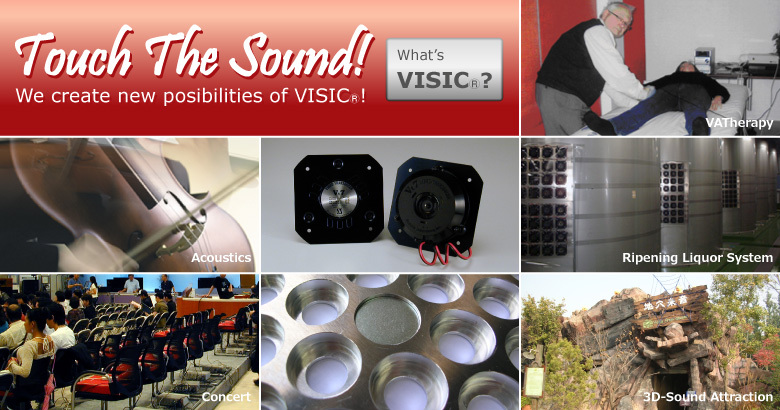 As has been marketing and selling a VISIC® head pad. Acouve VIBRO transducer has been highly evaluated by Dr. O. Skille about its quality and performance, since it is proven to be effective as a therapy equipment. It is possible to add further vibration effects to actual sound effects of car, airplane, boat engine noise or horns, or of earthquakes, mud flows or volcano eruptions, The newly developed VIBRO-Effect System makes it possible to record sound effects in the fields through its pick-up device. It can reproduce body sensing vibration exactly in the same way as it was recorded, while a conventional microphone based recording and reproduction can not. It is patent pending, for Acouve Laboratory Inc.